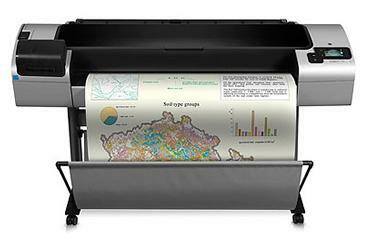 The HP Designjet T1300 1118mm ePrinter is the first ever large format ePrinter from HP that is designed for workgroup use. It offers excellent productivity with faster print rates, and economical paper and ink saving settings. The HP Designjet T1300 1118mm ePrinter can produce as many as 103 A1 prints in an hour, using HP's thermal inkjet technology. However, it may not be a practical investment for offices with minimal large format printing requirements, especially with its expensive price tag and high running cost. Measuring about 177x721x105 cm, the HP Designjet T1300 1118mm ePrinter is still relatively compact, even when mounted on the printer stand. It has a 32 GB memory and a 160 GB hard disk, ideal for heavy print loads and it uses six different ink cartridges, adding matte black, photo black, and grey to the usual CMY palette. The HP Designjet T1300 44 inch ePrinter has two automatic roll feed units and a sheet feed, which allow versatile paper handling. The HP Designjet T1300 1118mm ePrinter is ideal for many different print applications, it can handle many different types of media from A4 through A0 in size, and it offers versatile connectivity via the Ethernet and high speed USB slots. The device also supports many different operating systems, and it can produce as many as 103 A1 prints per hour. However, the HP Designjet T1300 1118mm ePrinter can be quite expensive to own and run, especially with six different print cartridges to maintain.